Figure 1: The Sodicho Rockshelter is situated in the southwestern Ethiopia Highlands (data Aster GDEM) (A). Detail of an autoradiography image – dark spots are high radiation emitters (B). Generated DEM with location of the rockshelter (data by Airbus) (C). Particle structure of quartzite stone artefact. Image was taken with a Dino-Lite Digital Microscope, mag. 50x (D). Through a start-up honours grant from the Graduate School of Geoscience I could bridge five months as a Research Assistant (WHK) at the Institute of Geography on my way to my PhD project. This financial support gave me time to prepare for my research: gathering first literature, participating in the evaluation of the third DFG proposal of CRC 806 “Our Way to Europa”, and acquiring methodological skills as part of the project A1. My PhD research will be directed to the recently discovered archaeological site Sodicho Rockshelter in the southwestern Ethiopian Highlands (Fig. 1 A). 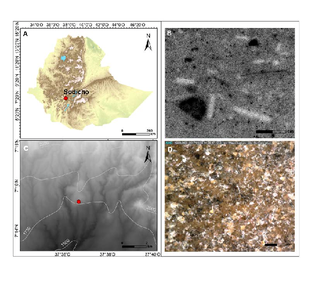 I plan to apply a multi-methodological geoarchaeological approach and to correlate the obtained data with those from the key-site stratigraphy of Mochena Borago Rock Shelter in SW Ethiopia. program ENVI ® (Fig. 1 C). Furthermore, I presented a concept poster of my planned PhD project and a second poster showing the research results of my Master’s thesis at the annual national conference of the Arbeitskreis Geoachäologie at the University in Erlangen in May 2017. As a last point, I had the opportunity to work with the research team of the project “At the margins of Late Pleistocene subcontinental networks” (directed by Dr. Isabell Schmidt, Institute of Prehistoric Archaeology, UoC) at the National Museum of Namibia in Windhoek. I carried out petrographic investigations of the lithic raw material used for stone tool production from the Pockenbank Rockshelter – the main excavation site of my geoarchaeological analyses for my master’s thesis. I will apply the earned knowledge of lithic material of the Middle and Late Stone Age in the upcoming A1 project (Fig. 1 D). I would like to thank the Graduate School of Geosciences and the steering committee for their financial support. This generous grant enabled me a preparation for my future PhD research and opened up new scientific contacts and opportunities. Last but not least, I want to thank Prof. Dr. Olaf Bubenzer, Dr. Ralf Vogelsang, Dr. Andreas Bolten, Dr. Dominik Brill and Dr. Isabell Schmidt from the University of Cologne as well as Dr. Daniel Rufer from the University of Bern for their supervision, support and scientific impulses during this research.